Increased emphasis on recycling is a sustainable approach to waste management and should help municipal levels of government divert organic waste from landfills to composting programs. 40% or more of current landfill waste is organic waste that can be used in compost programs. If collected and processed properly the compost can be used for the benefit of society and to extend the life of current landfill sites. Municipal Green Cart Programs have proved to be highly successful and curb-side collection programs are growing in popularity. Compost produced by Green Cart collection programs enable municipal government to use the compost for local regional uses including: in parks, residential uses, farmland and is sold to local greenhouses and soil distribution and landscaping companies for inclusion in their triple mix and other soil products. The quality of compost produced directly affects the value of the finished product. The higher the quality of compost produced provides the municipality increased revenue for the compost when sold to the private sector. Organic waste collection, which allows plastic bags to be used for the collection of greens, reduces the quality of the finished product as some of the plastic remains in the final compost and is not fully separated during the production process. It is estimated that approximately 30% of the plastic bags which are used in the collection of organic waste used in green cart programs is not removed from the final compost produced and contaminates the soil in which it is mixed! There are some government municipalities, which recognize this problem and ban the use of plastic products -especially polyethylene bags from their green cart programs. Consider using biodegradable bags when collecting organics. Biodegradable bags which carry the BPI (Biodegradable Products Institute's logo) it is your assurance that the product is fully 100% biodegradable and 100% compostable. BioBag® bag liners carry this logo and the new BNQ Compostables logo and can be used in municipal curb-side collection. 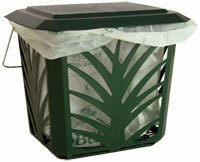 The purpose of bag liners is to make the chore of daily organic collection quick and simple. Bag liners reduce the time required for clean up of organic residue and also allow the organic content collected to dry. The drying process reduces odours and mess by delaying the fermentation process until the organics reach the waste management composting facility. BioBag® bag liners "breathe" as they are permeable allowing air to pass through the membrane so that the contents can dry out while organic waste is collected. The overall weight of the organic content is reduced in the process so that handling and transportation of the organics is improved. Bin liners such as the BioBag® Food Waste Bags and EcoProduce Bags can be used in kichen bins such as the MaxAir or other kitchen bins or crocks designed for organic waste collection. The design of the container is important and should have some form of ventilation to allow the contents as it is collected to dry out. If the contents do no have ventilation the organic waste will rot and will start to create unpleasant odours and fruit flies may be a nuisance. Consider lining your Green Cart as well - this will reduce the necessity to wash and clean the large container on a frequent basis. BioBag® Tall Kitchen Bags are designed to fit the Green Cart and suspends the bag slightly above the bottom of the Green Cart allowing air circulate around the bottom of the bag / bag liner. Green Cart Organic Waste Collection programs benefit us all by diverting organic waste from landfills and can be used for many environmental purposes. Together we can all work to improve the adoption of Green Cart programs across Ontario and to make the task quick and simple in our daily lives. Keep your green cart outside in a shady, convenient, well-ventilated area. During the winter, move green cart closer to your house to allow for easier access. After each green cart collection day, insert a bin liner such as a BioBag® and line the bottom grate of green cart with used paper towels, used paper plates, leaf and yard waste, to absorb liquid or moisture that escapes from food scraps. Keep air vents located at the bottom of the green cart clear to allow for air circulation. collection day even if your cart is not full. rock salt, baking soda or lime inside your cart to control fruit flies and prevent pests. in your Green Cart and Kitchen Bin quickly and effectively without masking them. to 32% in 7 days resulting in reduced volume, weight and transportion costs. packaging to be recycled through composting facilities. All BioBag® products carry the BPI & BNQ Compostables certification. Over 3 Million SOLD ! Reduce Odours, flies and mold- order yours today! PLEASE DO NOT USE PLASTIC BAGS FOR DISPOSING OF ORGANIC MATERIALS IN YOUR MINI KITCHEN BIN OR GREEN CART use a certified BioBag® bin liners.